These beautiful Zen gardens are Japanese rock gardens, or “dry landscape” gardens. These zen gardens create a miniature landscape composed of rocks, moss, and mini trees. The sand and rake are used to represent ripples in water. Wouldn't it be great if you had something at your fingertips you could use for a few minutes to calm down, relax and bring peace to your core? Well the good news is you do! It's a desktop Zen garden. This piece of paradise for your desk creates the same feeling found in full-size Zen gardens, but on a much smaller scale. Bonsai trees are an affordable way to take your zen gardens up a notch. What is a (desktop) Zen garden? Do you remember when you were a child and you would zone out in the sandbox? You were so focused on what you were making that you would forget the world around youÖ almost transformed? This is the same theory in which is a desktop Zen garden works: it allows you to relax, focus and takes you into ultimate concentration mode. Known as a Japanese rock garden, the Zen garden is an ancient outdoor ritual that usually involves a sandpit with rocks and grass, as well as a few other plants or nature elements. It is designed to represent the different soothing elements in our environment. You will often see patterns in the sand in Zen gardens. This represents rippling water. Originally, the gardens were used by ancient Buddhists as a tool for meditation. Since the world has so many external distractions, having a desolate garden to tend to helps relax the mind with various sand tracings and rock formations. 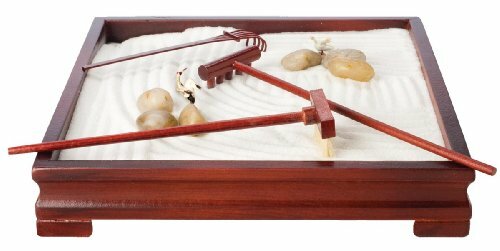 Why should I create or purchase a desktop Zen garden? A desktop Zen garden has myriad of benefits! One of the biggest benefits is stress relief. By combing the sand and re-arranging the rocks methodically, you can begin to relax. When you focus on the repetitive physical movements, it quiets your mind and allows you to truly experience and live in the present moment. What are the benefits of a desktop Zen garden? 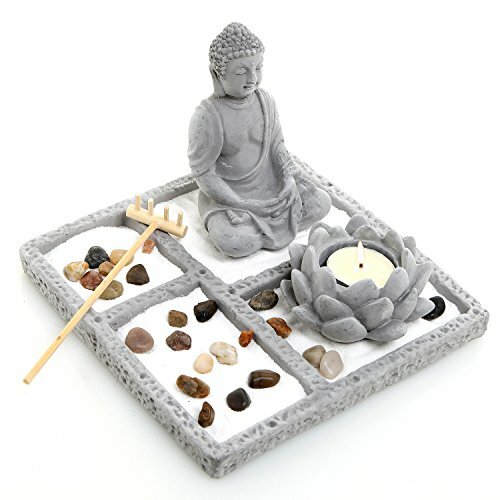 Along with increasing your creativity to lowering your stress, a Zen garden can improve your health and well-being. 1. Promotes stress-relief and helps you to relax. This is one of my favorite benefits of my Zen garden. By combing the sand and rearranging the rocks, you are taken to a soothing, calming and meditative state. Zen gardens that have natural greenery in them bring relaxing energy to your space and a Buddha statue near or in your garden can bring peace and serenity, even if you are at work or in the middle of a hectic day. When you're trying to come up with your next big idea or find a solution to a problem, use your Zen garden! It helps to garner creativity and assist with problem solving. Meditation is known to promote innovative thinking and give way and space for new ideas to grow. 3. Ongoing Reminder of your Practice. The Zen garden can remind you of your practice and provide a more visible connection to it. Mindfulness should not be kept to a certain time set aside, the goal is to stay connected and engaged with your practice throughout the day. A desktop Zen garden is the perfect way for it to stay top of mind. 4. Enhances Beauty, Balance and Flow in your decor. Think of a desktop Zen garden as a fresh bouquet of flowers that keeps on giving! Not only does your Zen garden make your space look striking and simplified, it brings a one of a kind beauty and enhances your existing space. Creating the designs in the sand can also add spice to any decor and you won't have to change the water like you would with real flowers. Add Bonsai trees to your zen gardens for an easy-to-maintain dash of greenery. 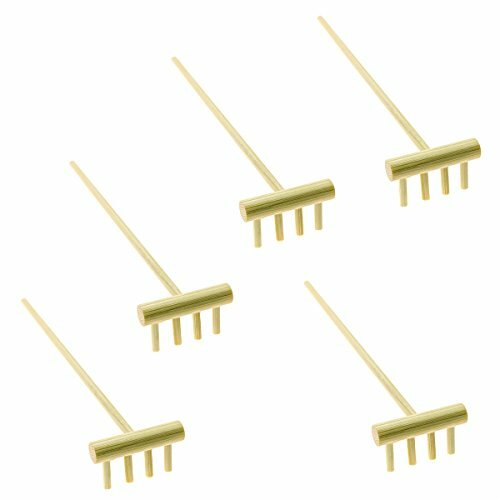 How do I stopped being stressed and create my own desktop Zen garden? It's super easy! See instructions below. Cheers to you and your less stressful and move creative, relaxing life and environment! 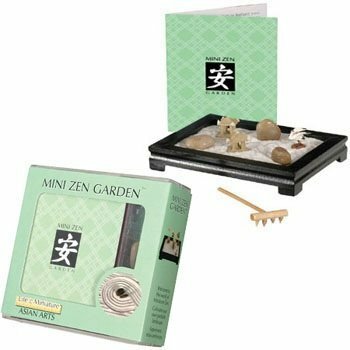 Want to buy your own desktop zen garden and accessories? Check these out! 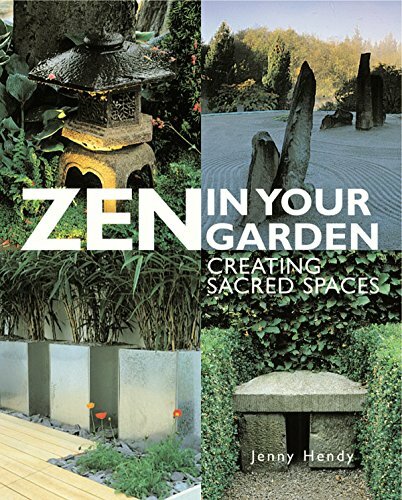 Pick a theme for your zen garden that speaks to your heart, mind, and soul. The goal is simplicity, so keep that in mind while crafting your garden. Fill your container about halfway with sand (I buy mine on Amazon). Add smooth stones or other items, but remember that zen gardens are not supposed to be cluttered. Less is more. Rake the sand with a plastic fork, pen, or another object that will create the designs you're looking for. Make soft ripples to represent calming thoughts of the ocean. For me, creating zen gardens is very relaxing and a great way to ease into meditation. The great thing about creating your own zen garden is that you can change the design at any time! Want to buy a zen garden instead of making your own? It's okay! You can do that, too. No materials to start a zen garden yet? Try some easy to care for plants, like cacti. Learn how to care for cacti here. Download my free printable CRYSTALS calendar by clicking the image below! Funny Santa Pictures – When Kids are Scared of Santa! Awesome.. I think these would make the perfect gift for my girls teachers!! These are so nice to look at. Makes me want my own flower garden even more. I think I may venture out this weekend and get the stuff to make one of these. They are very cool. I work at home as a medical transcriptionist and get a little frustrated at times because I can not understand some of the doctors, this could be my ticket to sanity. Thanks. I’m going to make one of these to take to work! Thanks for the idea! Those look fun to make. I like the idea of making them yourself, that way you can pick the colors you want. I missed this one, thanks to the celebration I’m in the know in time to do a few of these for Christmas to add to my home made body butter, sugar scrubs, and sore throat soother! Thanks! The cactus makes gorgeous swirlies but me and cactus would be a no-no because I would forget the sticks and try to do it with my fingers :) It does look easy to make and as soon as I don;t have uber nosy grandchildren and a baby pit bull that puts his nose into everything, even high up, I’ll have to try it! I like all the designs. I’ve only ever seen straight lines. I love the paisleys. Beautiful! I love cactus and succulents but was wondering, do you use any soil? I didn’t know they could grow in just sand only. How do you water without messing up the design? Love this idea! I LOVE zen gardens! You’ve shown some really great ones. Think I am going to make one of these as a gift! Love them Thank you for sharing! I love the one with the purple sand! So neat, thank you . This is such a great idea! Love it :) Thanks for posting! Those are amazing. I may do that with my grandson. He’s very artistic. I’m just amazed at the differentdesigns you habe. Love the colored sand! Kids love to do these! These look so peaceful. I wish I had had one when I was working. It would have been great. Love!! Great Christmas Idea too!! I dont wanna be a chicken I dont wanna be a duck Quack Quack Quack Yeah Im a Quack lololol Love the Zen!!!!! I think that is so pretty! How very neat! I love these! I need to make one!! I am going to try this. Maybe it will help me. These are awesome! Question, will this cactus actually live and grown in this sand? Beautiful! Love cactus and succulents but can they grow in sand only without soil? How would you water without messing up the design? Would love to try! I love your ideas. I need to have one of these in my house. Beautiful!! Great idea for a gift! If you include a cactus, do the roots have to be ‘netted’ before inserting it into the sand? Do you just water as needed? Pingback: affordable zen water feature – Shopping, Oh, the Shopping!